What Drives the Autonomous Vehicles Industry? AV technology is making powerful strides, but regulatory questions, issues with consumer confidence and liability concerns are creating road bumps for this young industry. Learn what’s in store for the AV industry in our new 2019 survey report developed in partnership with the Association for Unmanned Vehicle Systems International (AUVSI). The California Consumer Privacy Act takes effect January 1, 2020. Will your company be ready? Take our CCPA Readiness Benchmark Survey and opt in to receive the anonymous results of all respondents, including approaches companies are taking toward CCPA compliance. From developments related to virtual currencies and consumer finance to trends in food litigation, Chinese IP law and more, our 14 blogs offer timely information and insights on a range of topics that affect businesses every day. Our third Augmented and Virtual Reality Survey Report, created in partnership with the XR Association, indicates that augmented reality, virtual reality and mixed reality have enormous potential, but concerns remain about the quality of user experience, availability of content offerings and pace of adoption. Our partners teamed up with Microsoft for a CLE program focused on the legal intersection of technology and diversity. This program covers how in-house and outside lawyers can help clients make smarter decisions about technology that will have a positive impact on society. The Perkins Coie TechVenture Index™ is the benchmark measure of the emerging growth technology and venture capital ecosystem. Powered by market data, it provides a holistic view of the landscape, giving investors, companies and industry commentators insight into the health and trajectory of the market. Consummated Tech Mergers: Will the Government Seek to Unscramble the Eggs? There are increasing calls for the antitrust enforcement agencies to review the effects of past acquisitions in the tech sector. Sara Chenetz represents clients with varied interests in bankruptcy, restructuring, workout and litigation matters. wo midwestern states are taking up the issue of how to address the expansion of electric vehicles (or EVs) in their jurisdictions. The European Parliament approved several amendments to the European Commission’s proposed Regulation on preventing the dissemination of terrorist content online on April 17, 2019. With over 20 years of experience as an attorney built upon his prior engineering experience, Jordan advises and assists cutting-edge technology companies and entrepreneurs in all aspects of IP protection. John Devaney to Step Down Effective June 30. At this year’s PLI “SEC Speaks” conference held April 8-9, 2019, in Washington, D.C., the U.S. Securities and Exchange Commission’s leadership and staff showcased its 2018 successes and outlined initiatives that the SEC intends to pursue in 2019 and beyond. Electric vehicles (or EVs) cumulatively consume large amounts of electricity, which means regulated utilities have a natural interest in the expansion of EVs and in managing the impacts to the electric grid from that increased electric demand. The meeting earlier this month included many sessions addressing consumer protection. Some of the most interesting panels are discussed below. The meeting earlier this month included many sessions on merger enforcement. A number of the important issues addressed by the panels are discussed here. The Perkins Coie TechVenture Index™ provides historical data beginning with Q1 2002 and is updated quarterly. The blog provides practical tips and updates on emerging privacy and data security issues, with a focus on operational incorporation of privacy/data security principles in a business environment. Recognized by Law360 as one of the firms that “crushed it” in patent cases decided by the Federal Circuit in 2018, Perkins Coie captured the highest win percentage of all ranked firms with an 85% success rate and ranked third in total victories. The food and beverage industry is one of the top targets for class actions and individual lawsuits following increased attention to product labeling, advertising, GMOs and consumer fraud. 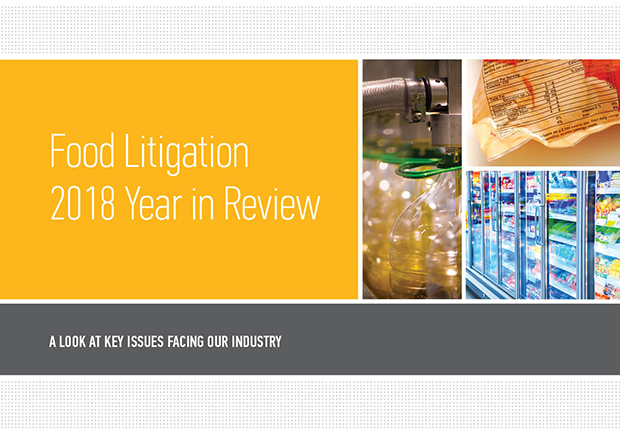 Discover these and other key trends in our 2018 Food Litigation Year in Review. Perkins Coie Partners Judy Jennison and Dominique Shelton Leipzig joined Neil Suggs, Vice President and Deputy General Counsel at Microsoft, to provide one of the first programs in a new video-based Continuing Legal Education (CLE) platform by In-House Focus. The one-hour program encompasses diversity and inclusion, business ethics, privacy and cybersecurity, and technology. Perkins Coie is proud to announce that it has been named among the 2019 FORTUNE 100 Best Companies To Work For® for the 17th consecutive year.